It's not every Master of Arts in Management student at The College of St. Scholastica who's called a star by a prominent business publication. 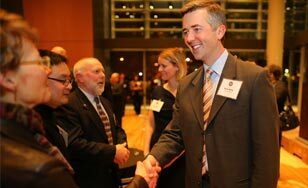 But that's what happened to Duluth Mayor Don Ness, who has been named Person of the Year for 2013 by Twin Cities Business magazine. St. Scholastica was a sponsor of the Jan. 9 Person of the Year ceremony in Minneapolis that honored Ness, 40. Ness credits the MAM program with strengthening his leadership skills. "I'd always wanted to go back and get my master's but the timing was never right, or I wasn't quite sure which direction my career would go," he said. "Then I became aware of this program and it seemed to fit exactly what my interests were — managing people and really focusing on the health of the organization. "It has been extremely helpful to have these courses and to think more philosophically about the role of a good manager, and to learn practical skills. And then, to be able to turn around and apply them directly in my day-to-day work within the city of Duluth," Ness said. "I've been very pleased with the quality of the teachers, the professors and the mentorship that I've found... I know that I'm coming out of this a better person, a more well-rounded person, with a better understanding of the roles and responsibilities of a person in leadership or in a managerial position. "I'm not sure the direction my career will go," Ness said, "but I know I'll be better prepared for leadership positions because of this program."